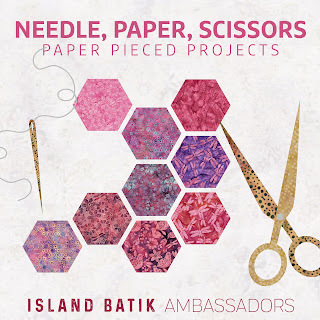 ....so the challenge this month is to use either foundtion paper piecing--FPP or English paper piecing--EPP....and since I feel quite confident with FPP the only obvious choice would be to try something new--let's give EPP a go!! 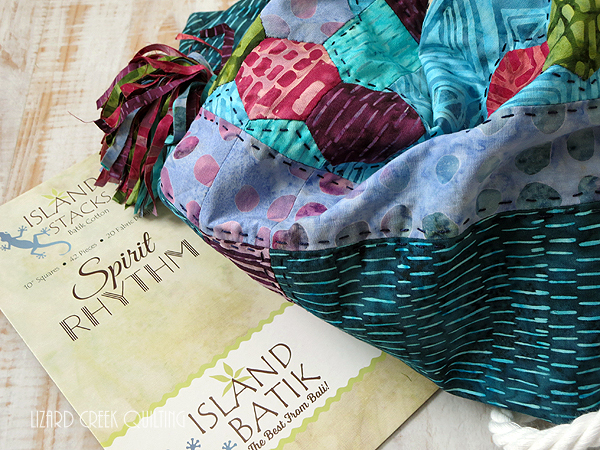 This 10" stack--Spirit Rhythm by Bella Nonna for Island Batik has been just calling my name since I received it in the second box of fabric from Island Batik this summer. 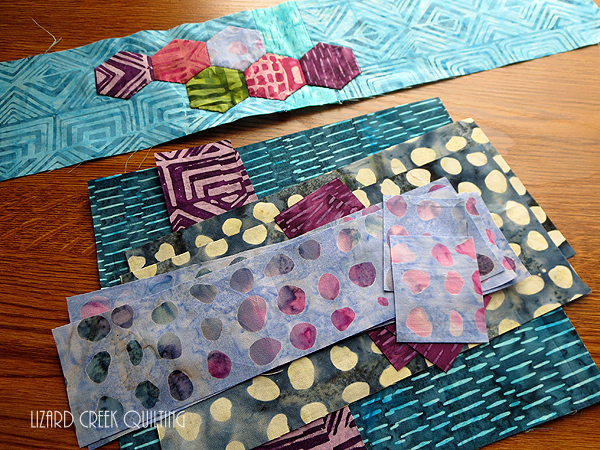 I really had no plan...other than to just start making a few hexagons and see how it goes. Aren't these colors just SOOOOO great!! Glueing the little shapes was quite fun--I had to stop myself from making too many--because I hadn't tried sewing them together yet!!! ....which led to some Slow Stitching by the fireplace...one thing I learned is to use a thin sharp needle. 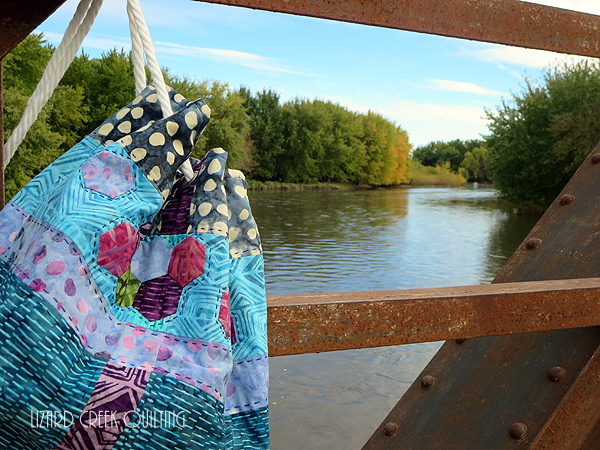 My first set of sewn pieces were a little chunky--but I am calling it "charming"!! 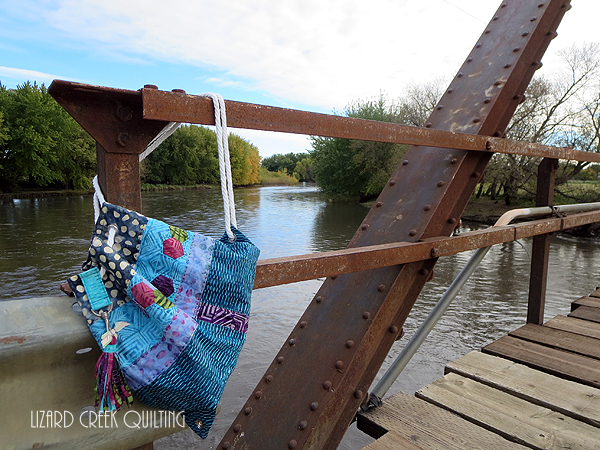 I had found the free pattern for this Bucket Bag on Sharon Holland Designs blog HERE. 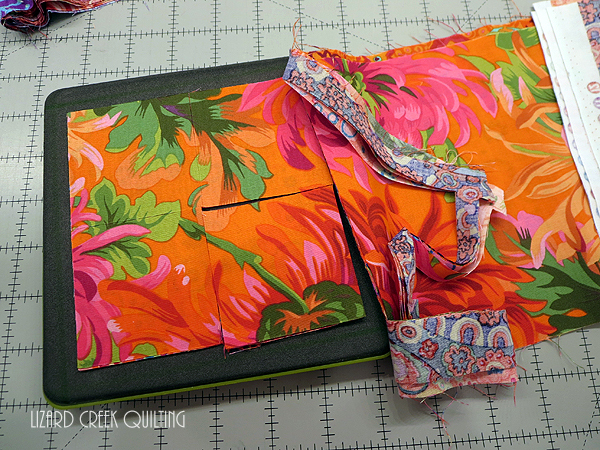 The challenge came using 10" stacks instead of yardage for the bag construction. So I improvised by adding a little extra piece to each strip to make them long enough. I even patchwork pieced the pocket sections. ...then wrapped another strip over the tied area, secured it with glue and clamped it together until it was dry. This is such a scenic place on the river near our home. We have used this bridge and surrounding landscape for many family photos, so I thought--why not try it for Island Batik projects--and I like it!! 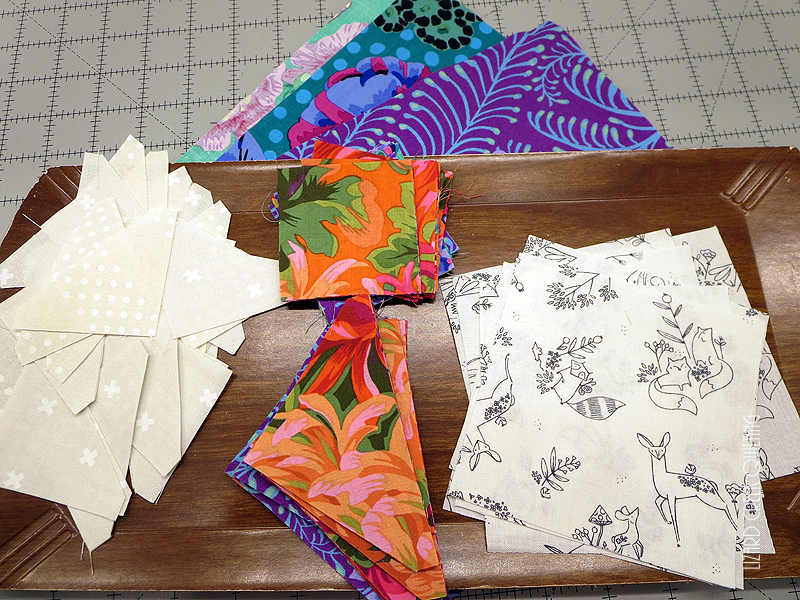 Look for these gorgeous fabrics in your quilt shop--if you don't see them--ASK for them you won't be dissappointed!! 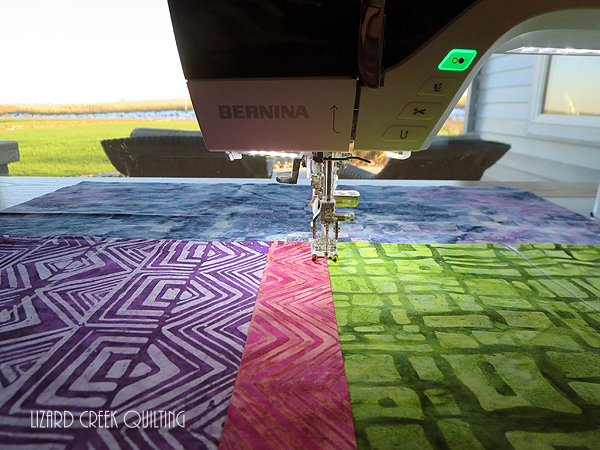 Round 3 of The Border Quilt...quilt along!! Sawtooth Stars!! 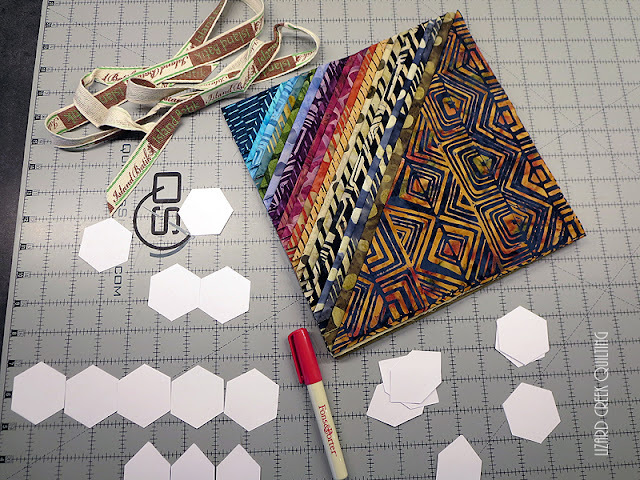 Make sure to check out Patterns By Jen for the pattern if you are just joining me. 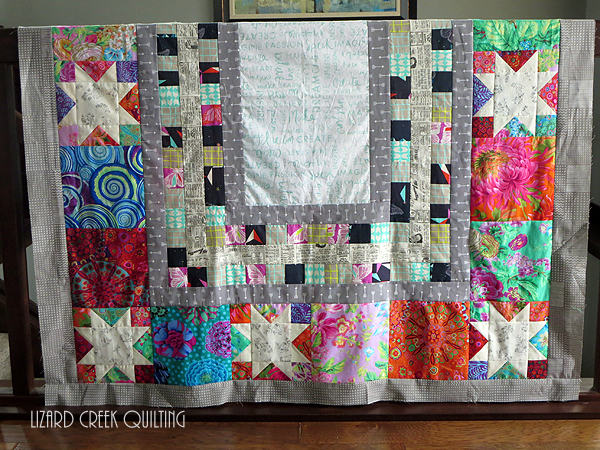 This is a cool quilt with mulitple borders which leaves lots of room to personalize and make it your own!! 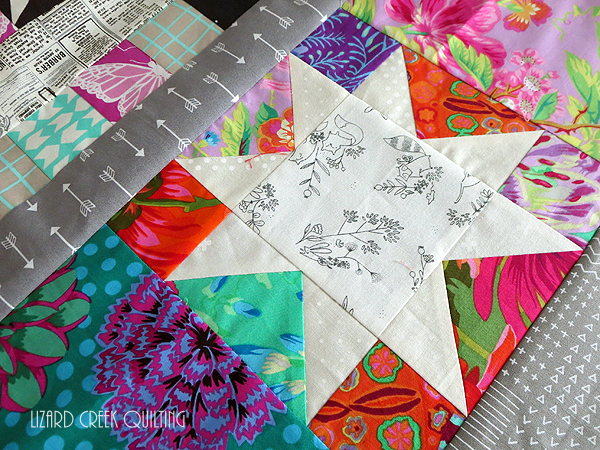 Go to her blog HERE to see how she makes these stars and find the other blogs sewing along!! 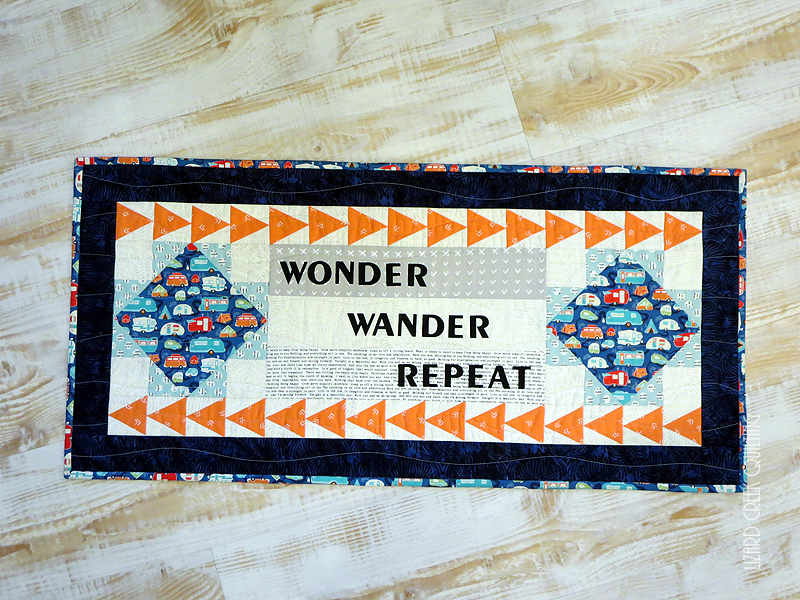 If you remember from my first post HERE, I am going really scrappy and quite spur of the moment designing with this quilt. 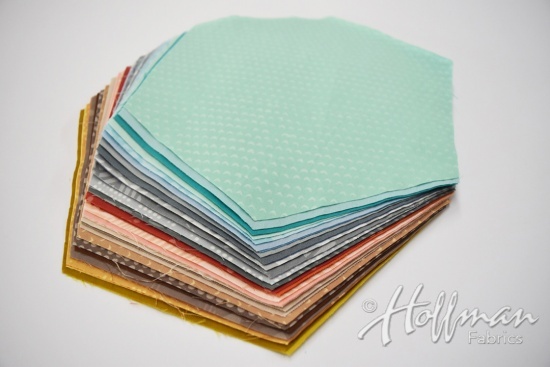 The fabrics used in this round where literally the top ones in the magical gray tote of fabric....check out the first post to see that I am not lying!!! 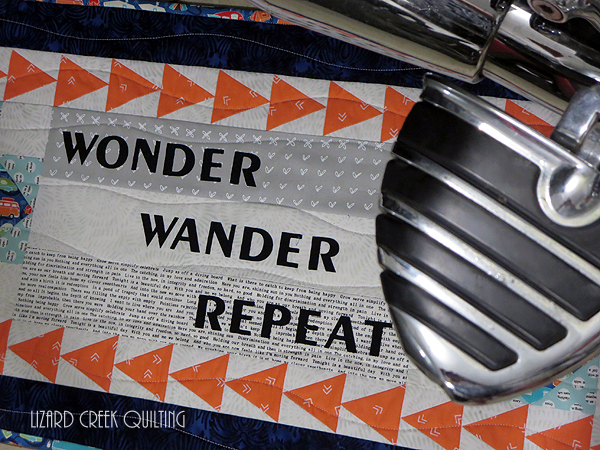 Jen writes great easy to follow instructions in her patterns. 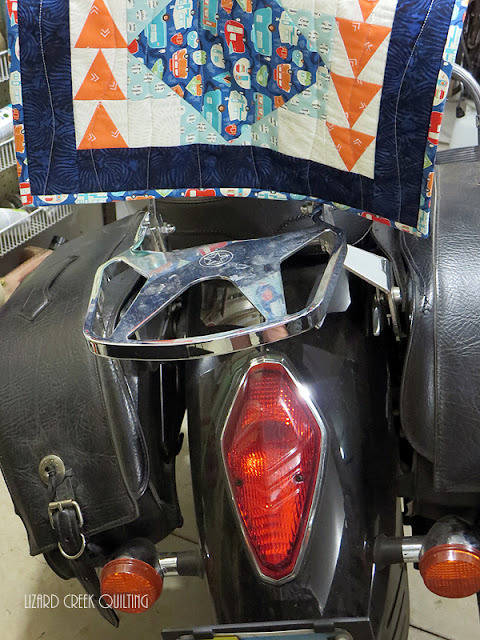 I just tend to be a rebel and usually go my own path...I cut my pieces with the AccuQuilt. 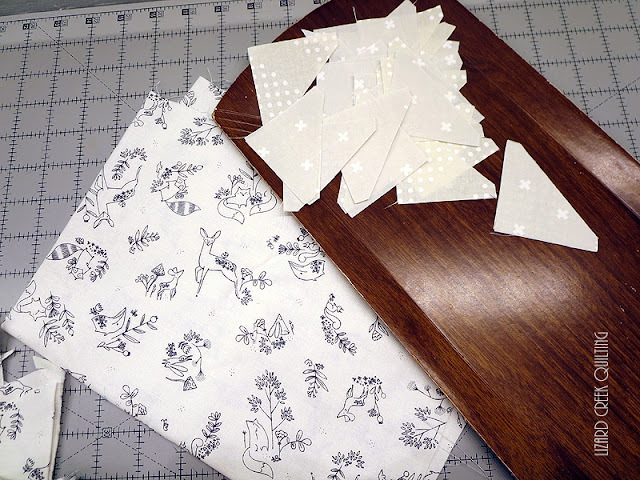 Unassembled sawtooth stars....all cut with the GO! 8" MIx & Match Qube. Isn't that animal print just so adorable!! 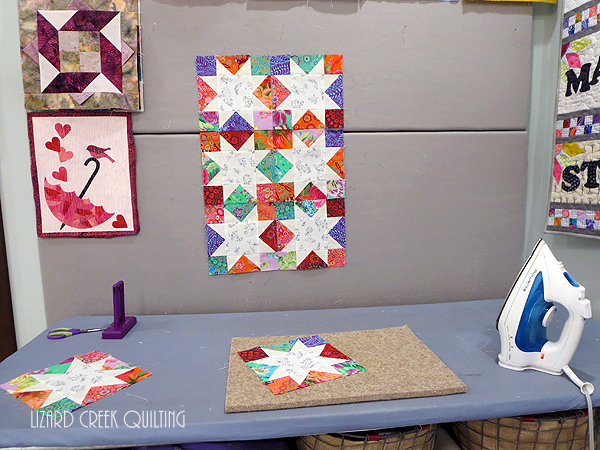 I have very little of it left from a Dahlia quilt workshop in my guild. It found the perfect place to live in thie Borders Quilt. 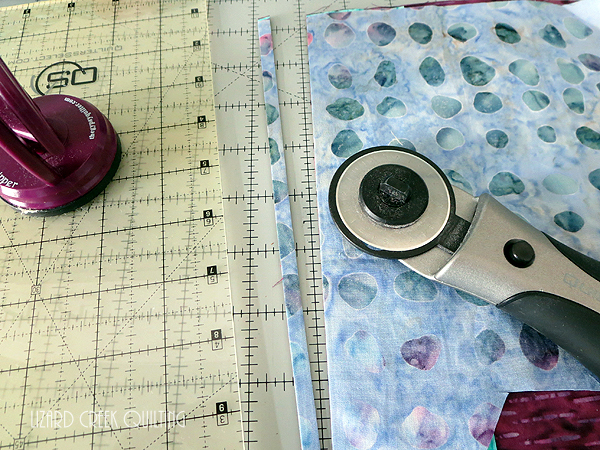 If you don't have one of these cutting gizmos in your sewing room....you should...I am not affiliated, just a fan!! 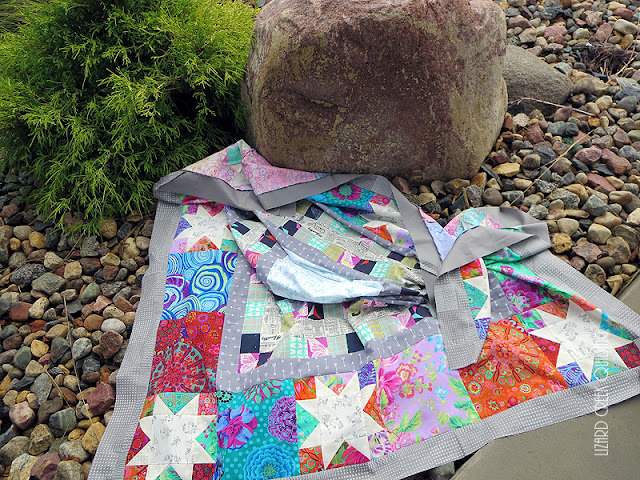 I choose to make 8 sawtooth stars and fill the remaining spaces with large scales print fabrics. 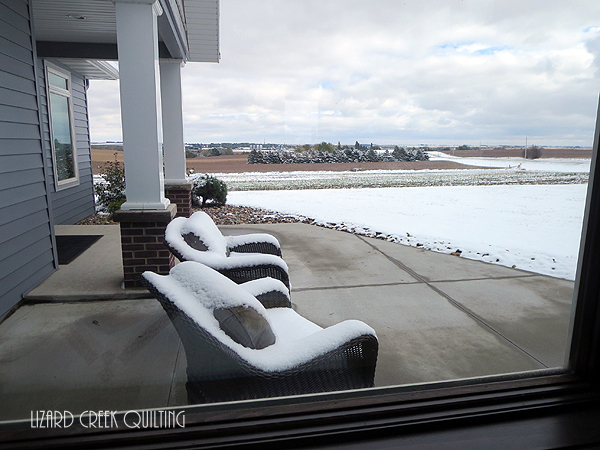 We haven't seen the sun here in Northwest Iowa for 2 weeks, with the last week being cold and rainy!! 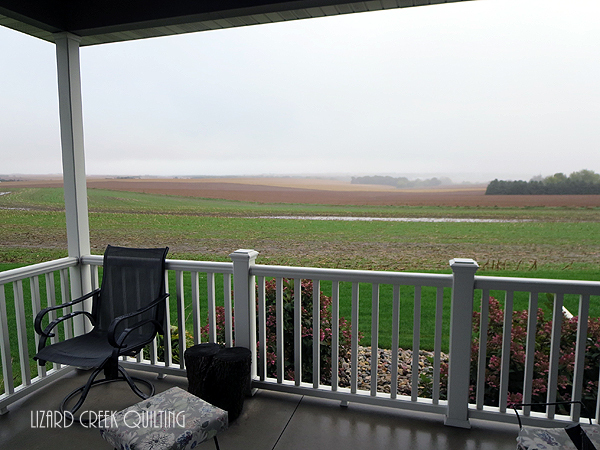 Most of our crops are still in the fields that have water standing in them like you see in this photo from our patio this morning. At least it isn't snow...which I am guessing Jen has today!! 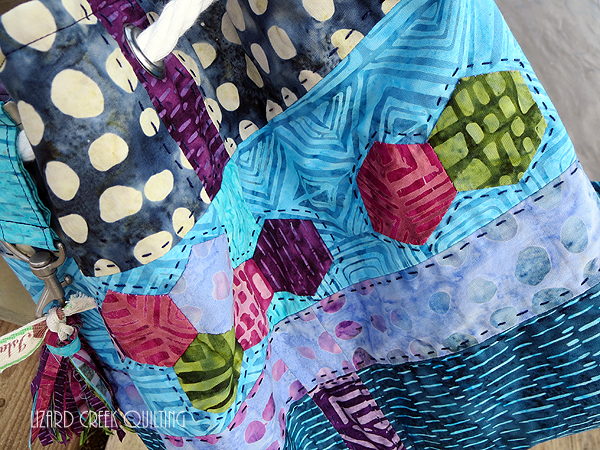 So working with these bright, happy and colorful fabric was a total bright spot in my life last night!!! Photo fail!! Like I said...cold...38 degrees and WINDY. Indoors for the photo today. Bookmark October 24 for the next round!! See you then!!! Lucky readers today!! I was part of an online Row Along--you can read that HERE. 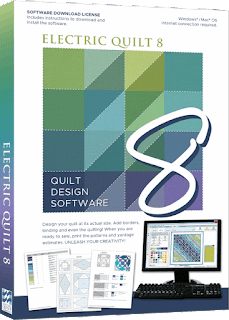 There was an Electric Quilt giveaway which is now closed....BUT Electric Quilt has offered a great discount code to all my readers!! 20 percent off any EQ product except classes. Great deal!! 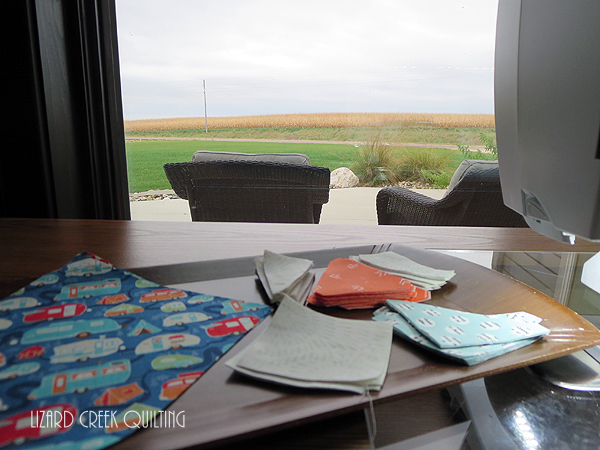 Hi there and welcome to Lizard Creek Quilting!!! I am happy to be sharing my row with you today!! I hope you have been enjoying your time collecting all the Happy Places and maybe found some new Happy Places you would like to be!! My Happy Place started a few years ago. 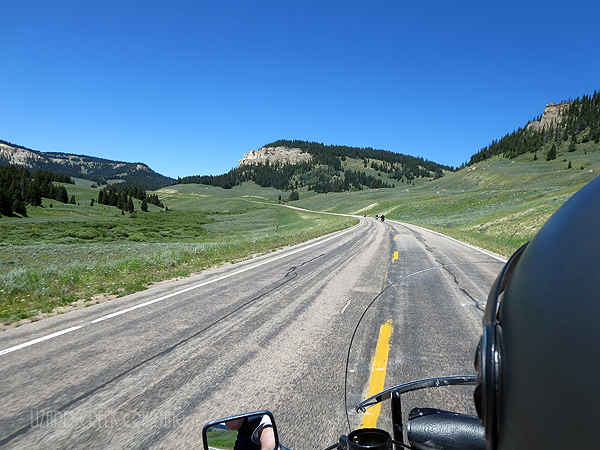 When our children were growing up my husband and I always said that when we became empty nesters we would get ourselves a motorcycle and just enjoy the countryside from the back of a bike!! 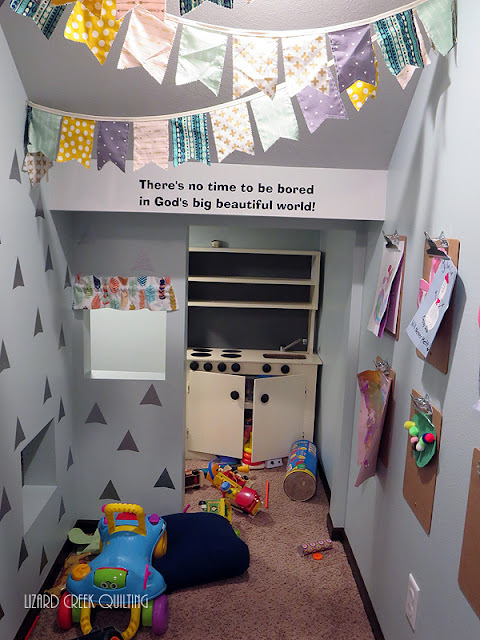 Trying to instill the love of adventure in my grandchildren with the quote in their hideout playroom under the stair steps of our home. Well we did that--and oh how we enjoy it!! So much so that we purchased a little used pickup camper so we could put the motorcycle on a trailer to pull behind the pickup. Then I come up with adventures and places to ride!! And my dear husband makes it happen!! I found a good one and plan on keeping him!! 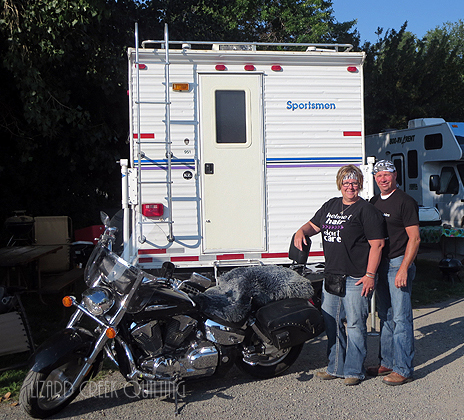 You can read about our first camper trip to Yellowstone National Park HERE. 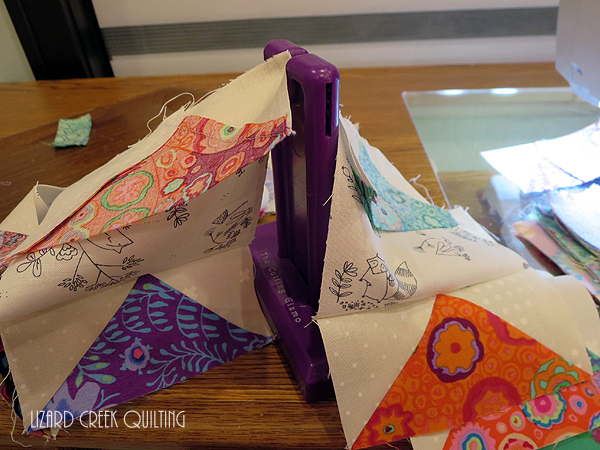 I have included several ways to make the Arrow blocks in the pattern. 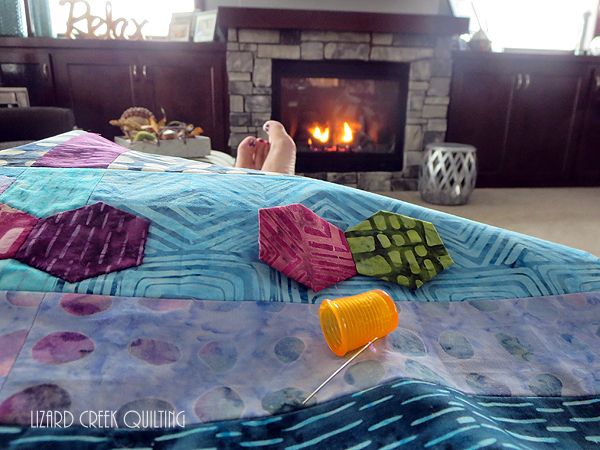 I use the AccuQuilt Triangle in a Square die #55410. 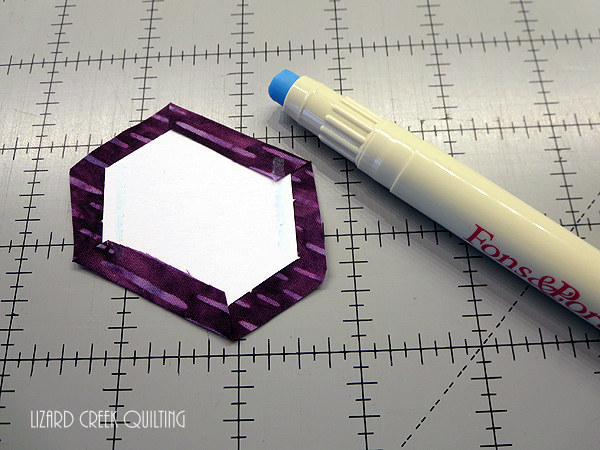 The Tri-Recs ruler is also a great way to cut out these different pieces. I choose to fussy cut the camper fabric so the campers would be going straight down the roads!! 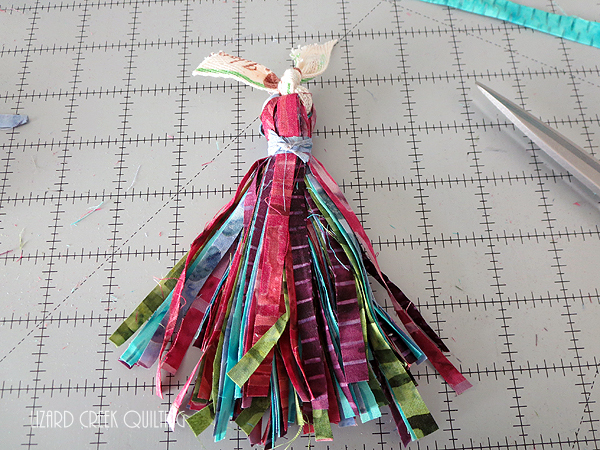 A little evening time sewing beauty!! 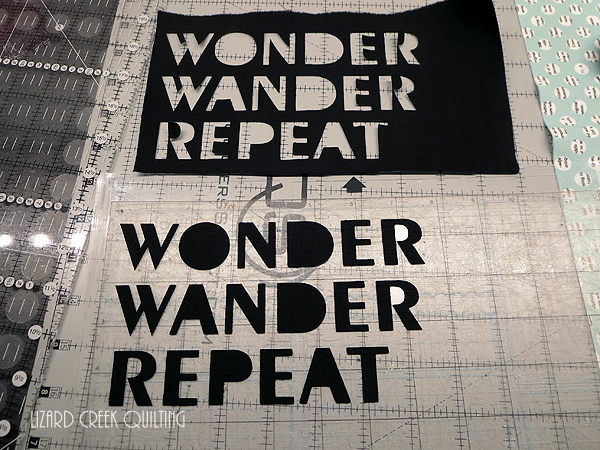 Included in the row pattern are the letters already reversed to use with fusible web tracing. I chose to use the Silhouette cutting machine to cut my letters. Either way will work fine--I was just in a time crunch as usual!! I used Island Batik solid black--this a new fabric they have come out with recently--it is the nice high thread cound fabric but in just a solid color. 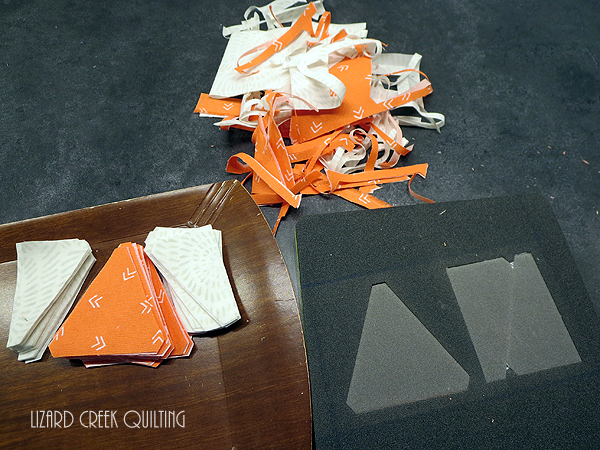 It worked amazing with the cutting machine. 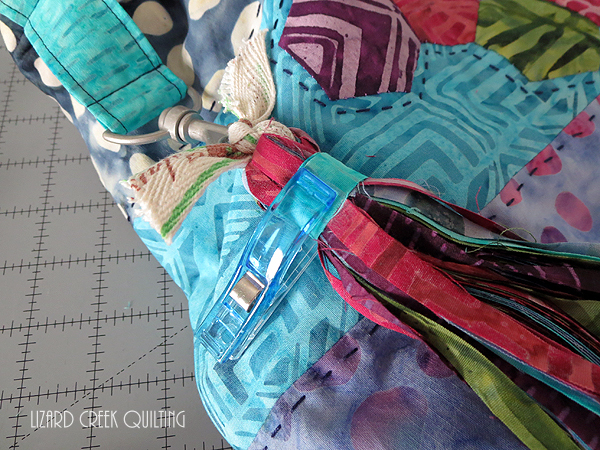 Apply Heat and Bond Lite to back of fabric. 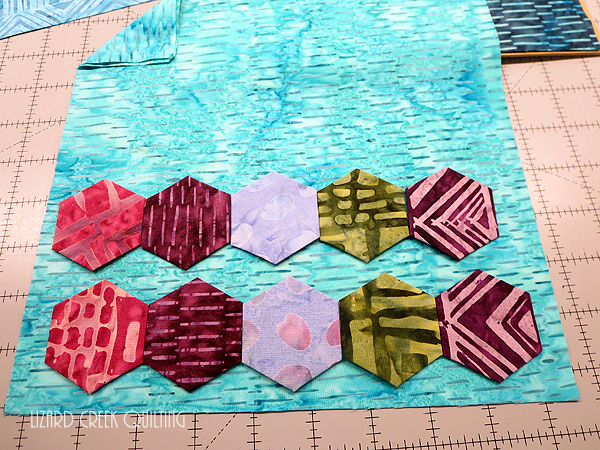 Place on cutting mat fabric side up. These are the settings I used--Blade-5, Speed-2, and Thickness-33. Also the font is Exotic 350 Bd BT in size 120 if you are wanting to try this yourself. It is just the coolest thing ever!! 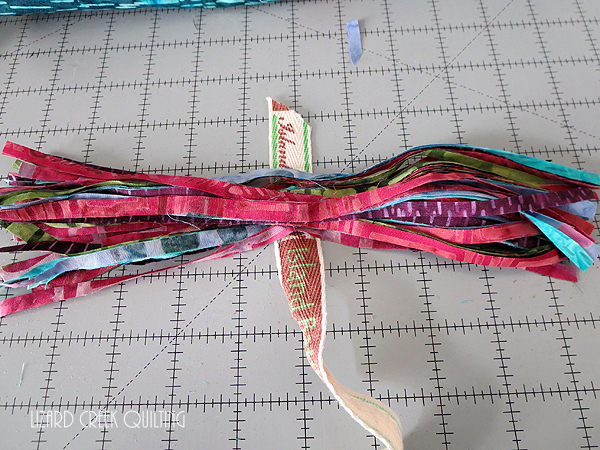 Just a few walking foot wavy lines for quilting to keep everything in it's place. And to give the feel of going down the road on the next adventure!! 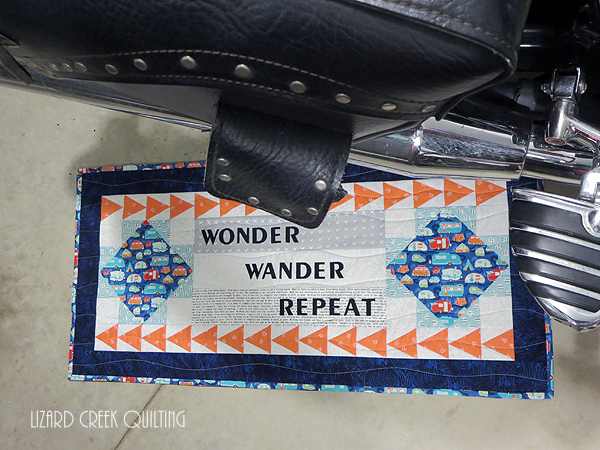 Wonder....Wander....Repeat!!! 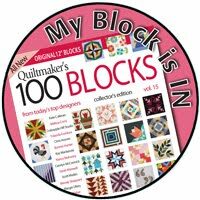 The pattern is on my Craftsy site HERE and will be free until December 31, 2018. My Happy Place!! 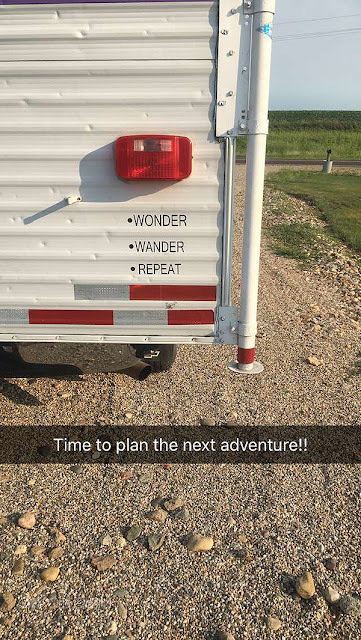 Going on adventures with my husband!!! 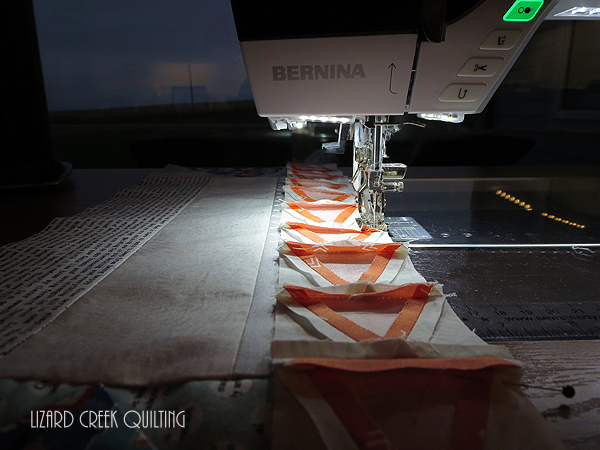 I want to thank Marian at Seams to be Sew for all the hard work she puts into this Row Along!! 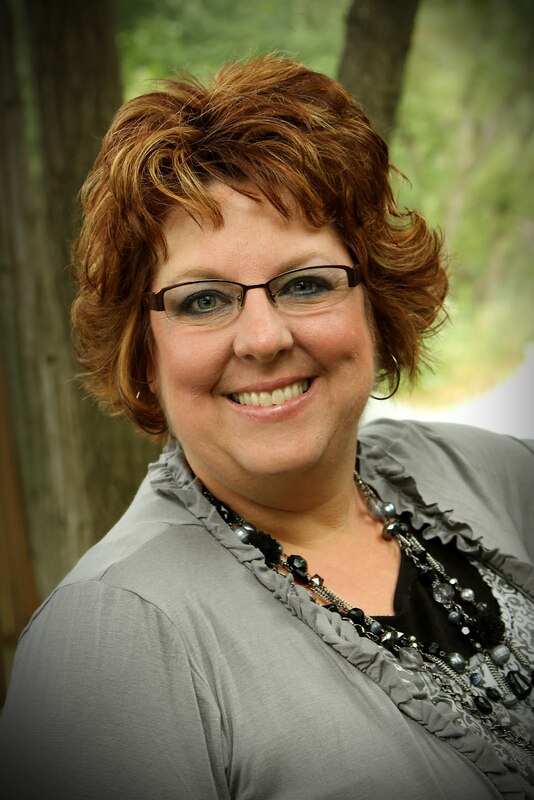 She puts in many behind the scences hours to secure amazing sponsors for the giveways. Makes it very easy for the designers to just design, sew and then show up!! 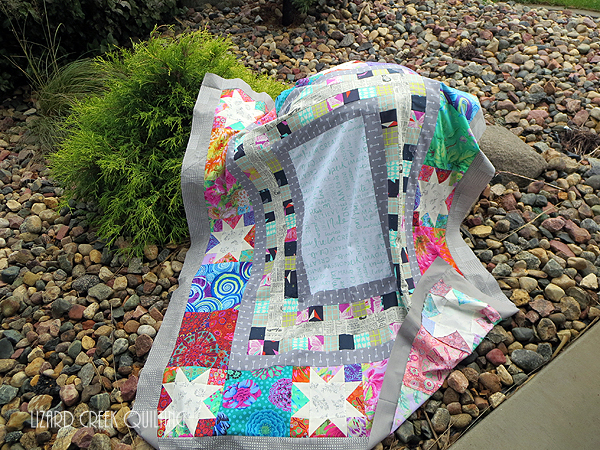 The giveaway for my blog today is from Hoffman fabrics. 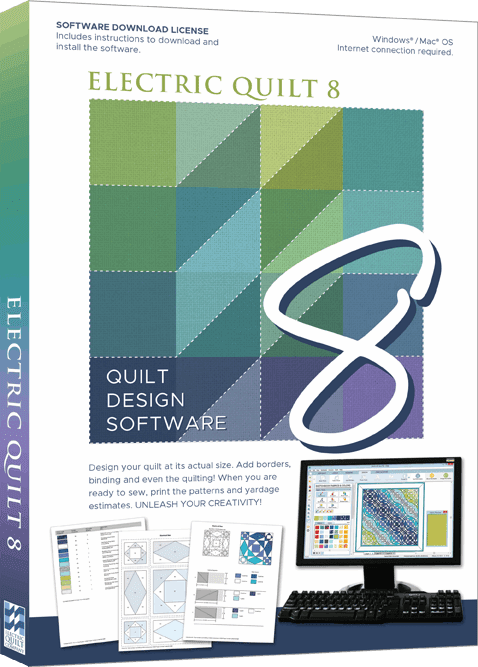 There is also a grand prize of Electric Quilt 8. There are several rules for the giveaways which can be found HERE. So I leave you looking at the tail lights of our motorcycle!! 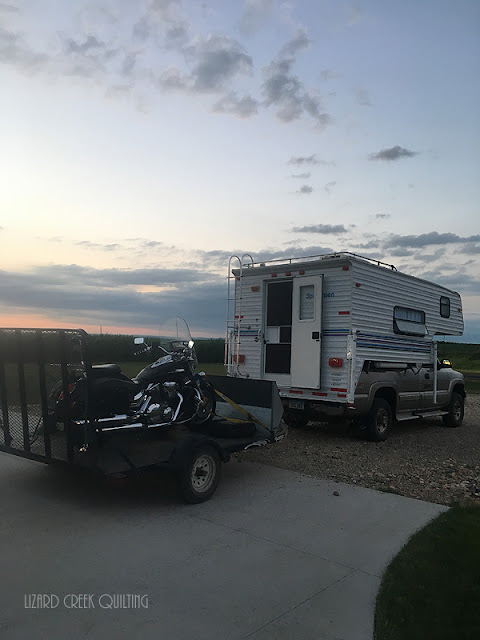 We don't have the adventure planned for next summer yet---leave me a comment where you think would be a great place to pull the pickup camper and ride motorcycle!! "The purpose of life, after all, is to live it, to taste experience to the utmost, to reach out eagerly and without fear for newer and richer experience. --Eleanor Roosevelt." 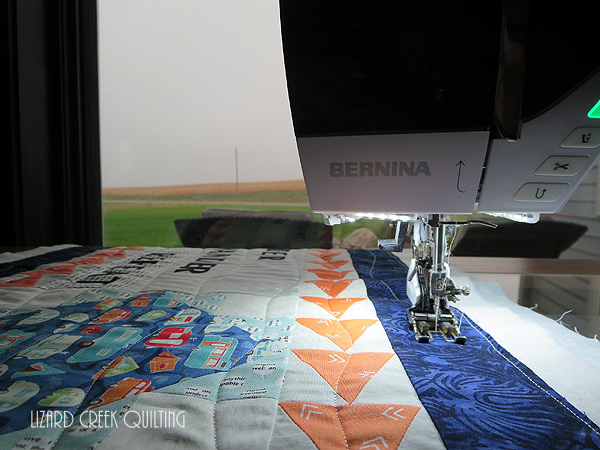 I have been sewing and making things my whole life--and recently added the pleasure of a longarm quilting machine to my list of things to do. 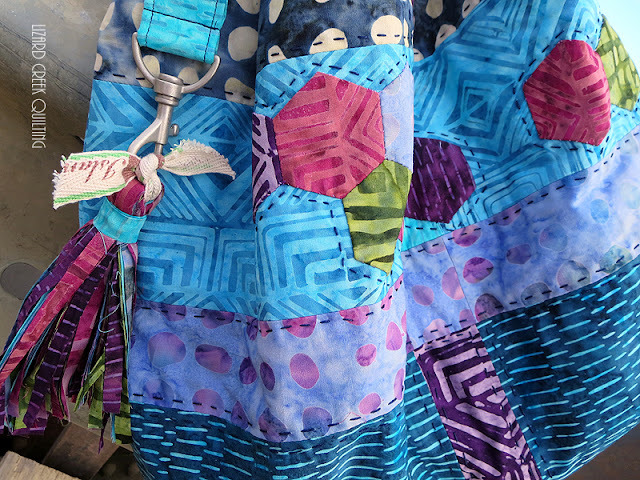 This has been a great experience and I love meeting new customers and hearing the stories of the quilts that they bring me. It also keeps me available for my farmer husband and my children. Life is busy and blessed! !